I was doing the rounds at each and every craft and party store in my area and realized that party favors are pretty ridiculous in price. Well, I didn't know what I could do. See, I'm originally from Boston. My own mother's motto with anything having to do with crafts or sewing was "if a glue gun can't fix it than neither can I". So, or rather sew, I knew making my own bags would be a heck of a lot cheaper and just as cute but I can't sew. Well, Mom-in-Law Berger saved the day. We got some fabric with a 40% off coupon and used ribbon I had on hand and made these sweet babies. It was actually sew (last time, I promise) easy that I probably could do it again on my own. Start by cutting strips of fabric- these are approximately 3x5in. See where my thumb is? Next you will sew to create the pocket where the drawstrings will be inserted. Hold the fabric so that the 3in side will be the height and 5 in side will be the width. Sew across the top of fabric about one in from the top and then again across the top only about 1/2 in from the top. Now you'll fold the fabric in half and sew the edges to secure the other two sides of the bag. Turn the bag inside out so the seems are on the inside. You want to make two little cuts in the pocket you created for the draw strings and thread through a piece of ribbon. Tie it in a knot and then tie one through heading the opposite direction. This way you'll be able to pull it closed. Side note- where can a person learn to sew these days, anyhow? The overall cost was mostly for the candies inside the bag. Cheap Frugal project anyone with a sewing machine could do. Not only that you can customize it with cute ribbons or coordinating fabric. Tools are for Women Too, Chic on a Shoestring, Tip Junkie, At the Picket Fence, Shabby Nest, Reasons to Skip the Housework, Simply Designing, Funky Junk Interiors, Nifty Thrifty Things, I Heart Nap Time, Creating Really Awesome Free Things, Petite Hermine, Craft Envy, Stories of A 2 Z, Hope Studios, New Nostalgia, Sugarbee Crafts, Ask Anna Moseley, DIY By Design, Passionately Artistic, Women Who Do It All, House of Hepworths, L Bratina, Beyond the Picket Fence, Shabby Chic Cottage, Fire Flies and Jelly Beans, Its a Hodge Podge Life, Just a Girl Blog, Simply Sweet Home , Inspiring Creations Blog, On the Verge 6, Fingerprints on the Fridge, Whipperberry, Remodelaholic, All Thingz Related, Saturday Mornings, Poppies at Play, The Girl Creative, Type A Decorating, At Home With K, Elements Interiors, Some what Simple and Stuff and Nonsense. omg that is funny about the glue gun fixin stuff! ikinda feel the same. if i can't us some kind of glue/epoxy it's trash. lol these are very cute. thanks for sharing them at my party. Cute idea! Seems like everyone is having babies right now--I'm sure I could use this soon! You got a new follower--would appreciate a follow back! "see" ya soon! Thank you so much for sharing these as well! Hey, I'm "Knew" 2 craft blogs. Never "Knew" they were so cool!! Love your blog and I will be following it. You have great ideas and the glue gun comments is to funny!! Very cute! Great job DIYing the expensive pieces! What a cute little idea. 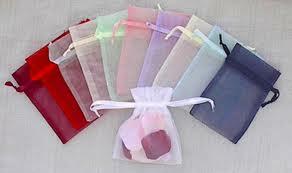 I love those organza bags. Does JoAnns have sewing lessons? Books, internet? MIL? Good luck! I would have imagined that they would be fiddly to make with orgnza, but if you say they were sew easy - then I'll take your workd for it! :) Might have to give it a try. I have some left over from my wedding dress. Great job with the bags!! You can learn to sew online these days. I'm a great believer in learning through real projects rather than practicing techniques. I try to make all the sewing tutorials I post as clear as possible with lots of photos, plus I've a series of tutorials i'm always adding to of projects anyone can sew in 5 steps and 15 minutes! (see my tutorials page if you're interesed!) Happy sewing! Love it!! I am so pinning it for later! Sweet little gifts!! Thank you so much for linking up to the Pretty Packages Party. The March Pretty Packages Party will begin tonight at 9:00 PM CST. Hope you'll stop by again!